Ottoia prolifica, (1:1) 8 cm. 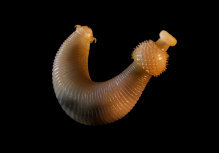 This is a worm-like fossil that belongs to the priapulid stem group. The only clear Ottoia macrofossils come from the Burgess Shale of British Columbia, which was deposited 508 million years ago. Microfossils extend the record of Ottoia throughout the Western Canada Sedimentary Basin, from the mid- to late- Cambrian. 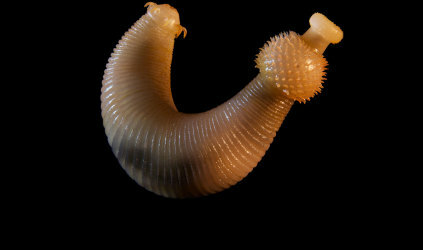 Ottoia specimens are on average 8 centimeters in length. Both length and width show variation with contraction; shorter specimens often being wider than longer ones. The characteristic proboscis of priapulids is present at the anterior, attached to the trunk of the animal. The everted proboscis of Ottoia bears an armature of teeth and hooks. At the base of the pharynx, separated from the teeth by an unarmed region, sits a ring of spines. Ottoia was a burrower that hunted prey with its eversible proboscis, but it also appears to have scavenged on dead organisms.